On Expiry day Nifty opened weak and saw a dip towards 5600 in the initial hours of trade, a short covering rally from there-on saw the index move up fast towards 5700, just to close below it at 5682.55, a cool gain of 40.95 points. On a week on week basis the index gained 31.20 points or about 0.6%. The broader market also performed well, with 908 advances to 567 declines. 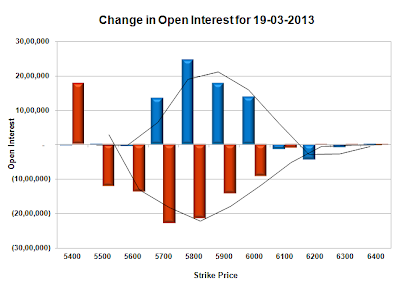 Its initial days and based on OI Table, the range developing for the series is 5600-5900 for the time being. Call option 5300-6100 added 26.16 lacs huge amount of OI with profit booking seen at 6200 and above strike prices. Put option 6300-5300 added 63.04 lacs huge amount of OI. 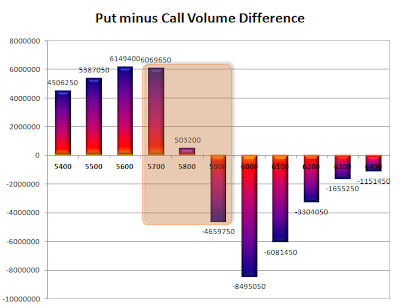 Highest accumulation on Call option 5700 at 36.83 lacs & 6000 at 33.52 lacs whereas Put option 5600 at 62.00 lacs & 5700 at 43.71 lacs. Nifty Open Interest is at 1,11,69,250 up by 19,62,250, with increase in price, most probably huge long build-up at start of series. Bank Nifty Open Interest is at 11,56,675, up by 3,23,200, with increase in price, most probably huge long build-up. FII’s sold 2.38 lacs of Futures, most probably long liquidation, as their net OI decreased by 289666 contracts and the average price per contract comes to around 5714. FII’s future open contract as on date is 264005. PCR Open Interest (Volume) at start of series is comfortably placed at 1.157. Support at start of series looks good at 5600, with OI above 61.99 lacs and below that at 5500 with OI of 31.07 lacs. Resistance building up around 5900-6000 level. Range as per Option Table is 5612 - 5723 and as per VIX is 5637 - 5728 with 5685 as the Pivot. Nifty had a range bound but volatile day with the index flirting with the previous day’s close and ending just above at 5641.60 a small gain of just 7.75 points. It was a positive day after 7 days of continuous red with a cumulative fall of more than 275 points. The broader market though was weak, with just 657 advances to 831 declines. 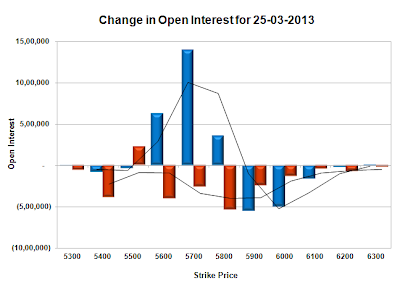 Based on OI Table, expiry could happen in the range of 5580-5670. Call option 5600 added 11.05 lacs huge amount of OI with profit booking seen at 5700 and above strike prices. Put option 5600-5500 added 11.24 lacs huge amount of OI with huge short covering seen at 5700 and above strike prices. Highest accumulation on Call option 6000 at 77.97 lacs & 5700 at 69.72 lacs whereas Put option 5600 at 80.39 lacs & 5500 at 64.47 lacs. Nifty Open Interest is at 1,21,60,600 down by 10,33,750, with no change in price, whereas April series added a whopping 23.74 lacs, 100% rollover with huge short build-up in next series. Bank Nifty Open Interest is at 11,83,450, down by 1,01,625, with increase in price, whereas April series added 3.95 lacs, 100% rollover with some long build-up in next series. FII’s sold 6.74 lacs of Futures, most probably short build-up, as their net OI increased by 66791 contracts and the average price per contract comes to around 5649. FII’s future open contract as on date is 553671. PCR Open Interest (Volume) is at 0.737. Support looking good at 5600, with OI above 80.39 lacs and below that at 5500 with OI of just 64.47 lacs. Resistance right now at 5700CE, with OI in excess of 69.7 lacs, and above that at 5800 with OI in excess of 68.4 lacs. Range as per Option Table is 5586 - 5691 and as per VIX is 5595 - 5688 with 5650 as the Pivot. Another day wasted by the Bulls, a gap-up on the back of good global cues saw Nifty scale 5700, but some rumour of Samajwadi Party withdrawing support from the UPA government, spooked the market and the index closed in red at 5633.85 a loss of 17.50 points. The broader market was also weak, with just 555 advances to 963 declines. Based on OI Table, now 5700 look like a good enough resistance and expiry could happen around 5600 level. 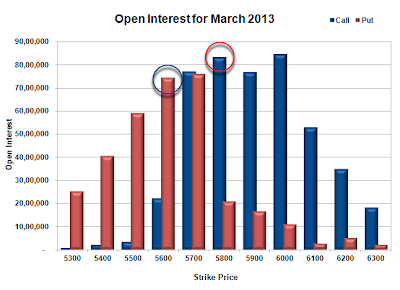 Call option 5600-5800 added 23.76 lacs huge amount of OI with profit booking seen at 5900 and above strike prices. Put option 5500 added 2.24 lacs huge amount of OI with huge short covering seen at 5700 and above strike prices. 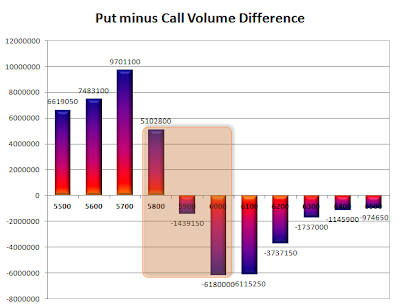 Highest accumulation on Call option 6000 at 84.76 lacs & 5800 at 83.26 lacs whereas Put option 5700 at 75.96 lacs & 5600 at 74.57 lacs. Nifty Open Interest is at 1,31,94,350 down by 2,88,850, with small decrease in price, whereas April series added a whopping 28.82 lacs, 100% rollover with huge short build-up in next series. Bank Nifty Open Interest is at 12,85,075, down by 1,50,725, with decrease in price, whereas April series added 1.71 lacs, 100% rollover with some short build-up in next series. FII’s bought 3.54 lacs of Futures, most probably long build-up, as their net OI increased by 99129 contracts and the average price per contract comes to around 5651. FII’s future open contract as on date is 486880. PCR Open Interest (Volume) is at 0.733. 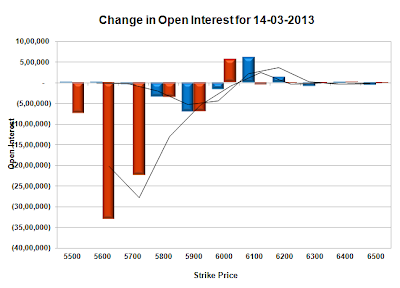 Support still at 5600 though covered some OI for the day and below that at 5500 with OI of just 59.05 lacs. 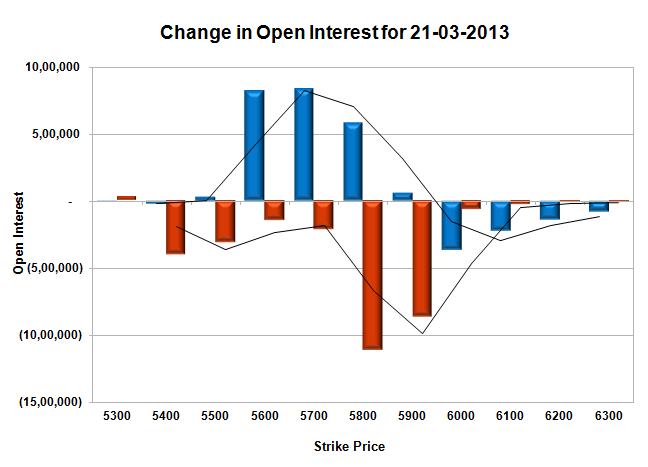 Resistance right now at 5700CE, with OI in excess of 77.1 lacs, and above that at 5800 with OI above 83.3 lacs. 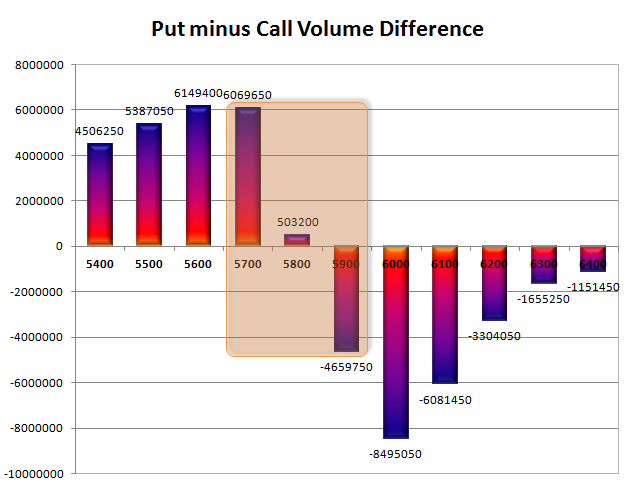 Range as per Option Table is 5601 - 5707 and as per VIX is 5586 - 5682 with 5650 as the Pivot. Nifty opened flat to positive and oscillated around the previous day’s close for the better part of the day with a dip towards 5630 being bought and a rise to 5690 being sold. The index ultimately closed flat at 5651.35, a very small loss of 7.40 points. On a week on week basis the index lost huge 3.8% or about 221 points. Though the index lost small but the broader market was weak, with just 457 advances to 1054 declines. 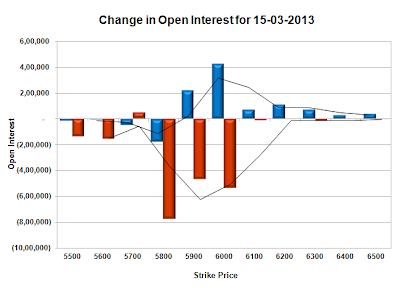 Based on OI Table, probable expiry range comes to around 5600-5700. 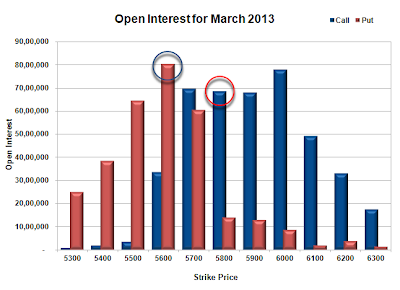 Call option 5600-5800 added 14.01 lacs huge amount of OI with profit booking seen at 5900 and above strike prices. 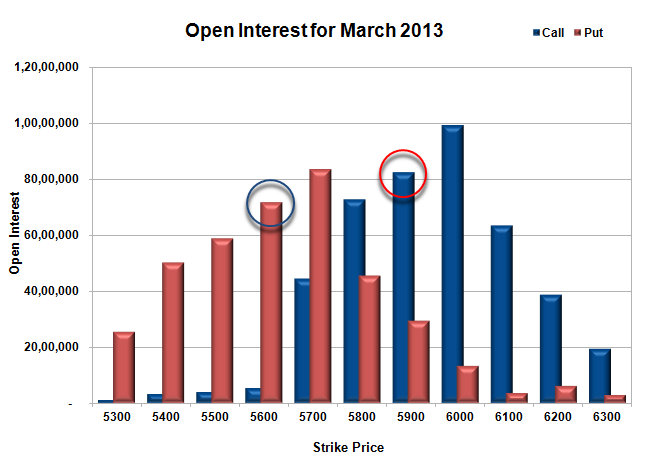 Put option 5600-5500 added 9.37 lacs huge amount of OI with huge short covering seen at 5700 and above strike prices. 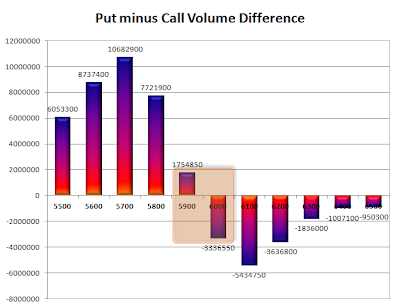 Highest accumulation on Call option 6000 at 89.76 lacs & 5900 at 82.34 lacs whereas Put option 5600 at 78.64 lacs & 5700 at 78.57 lacs. Nifty Open Interest is at 1,34,83,200 down by 9,82,050, with small decrease in price, whereas April series added 8.36 lacs, mostly rollover with small long liquidation. Bank Nifty Open Interest is at 14,35,800, down by 1,40,925, with decrease in price, whereas April series added 1.30 lacs, mostly rollover with small long liquidation. FII’s sold 5.57 lacs of Futures, most probably short build-up, as their net OI increased by 18723 contracts and the average price per contract comes to around 5668. FII’s future open contract as on date is 387751. PCR Open Interest (Volume) is at 0.788. 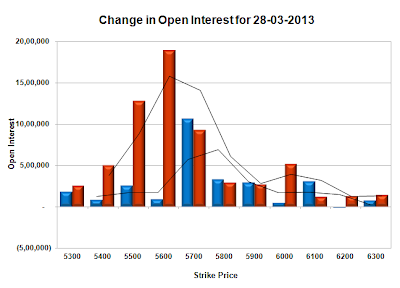 Support now shifted down to 5600 with highest OI of 78.64 lacs and below that at 5500 with OI of just 56.8 lacs. 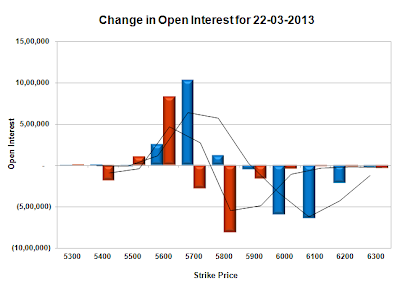 Strong resistance at 5800CE, with huge OI in excess of 79.7 lacs, and above that at 5900 with OI above 82.3 lacs. 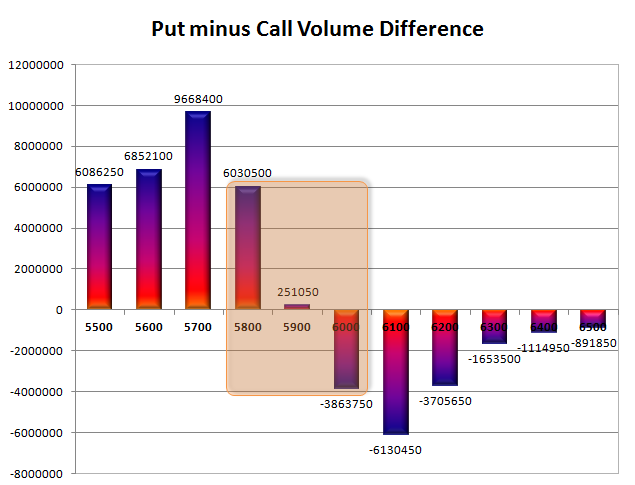 Range as per Option Table is 5606 - 5711 and as per VIX is 5605 - 5697 with 5670 as the Pivot. Nifty opened positive and after a small dip below the previous day’s close, went up fast towards 5755. The responsive sellers were waiting for this opportunity and moved the index back below the dotted line to close near the lows of the day at 5658.75, a loss of 35.65 points. The broader market was also weak, with just 406 advances to 1111 declines. Needless to say that the Bears are in full control of Option Table. 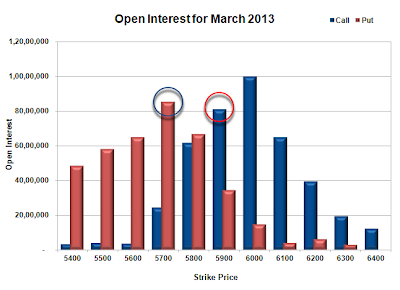 Call option 5600-5800 added 22.39 lacs huge amount of OI with profit booking seen at 6000 and above strike prices. Not much addition in any Put Option seen but huge short covering seen at 5700 and above strike prices. 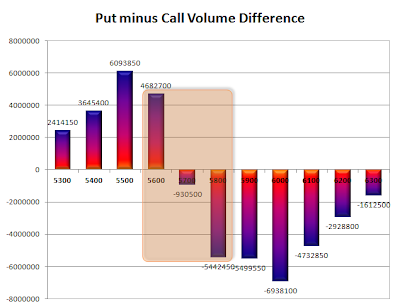 Highest accumulation on Call option 6000 at 95.77 lacs & 5900 at 82.87 lacs whereas Put option 5700 at 81.39 lacs & 5600 at 70.33 lacs. Nifty Open Interest is at 1,50,68,500 down by 6,03,250, with decrease in price, whereas April series added 4.30 lacs, mostly rollover with huge long liquidation. Bank Nifty Open Interest is at 15,76,725, down by 71,250, with decrease in price, whereas April series added just 8150, not much rollover but mostly long liquidation. FII’s sold 2.25 lacs of Futures, most probably long liquidation, as their net OI decreased by 28 contracts and the average price per contract comes to around 5664. FII’s future open contract as on date is 369028. PCR Open Interest (Volume) is at 0.798. 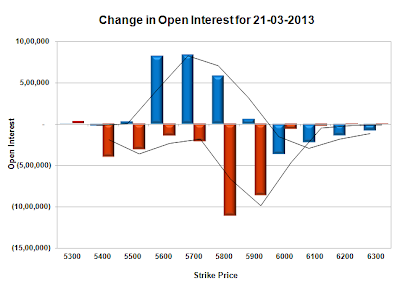 Highest OI on PE side at 5700, but price below it, next support at 5600 with OI of 70.33 lacs. Strong resistance right now at 5800CE, with huge OI now in excess of 78.5 lacs, and above that at 5900 with OI above 82.87 lacs. Range as per Option Table is 5630 - 5734 and as per VIX is 5610 - 5708 with 5690 as the Pivot. Nifty opened positive just above the previous day’s close, but went for a tailspin on the back of news that the DMK has pulled out of the UPA government. In-between the RBI governor cut repo by 25 bps, and kept CRR unchanged, which was in-line with market expectation. The index closed near the low point of the day at 5745.95, a huge loss of 89.30 points. The broader market was also weak, with just 335 advances to 1174 declines. Bears are in full control of Option Table, with Bulls running for cover. 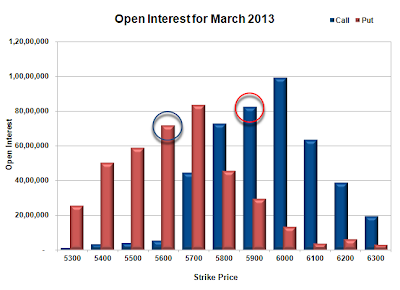 Call option 5700-6000 added 69.90 lacs of OI with profit booking seen at 6100 and above strike prices. Put Option 5400 added 17.89 lacs huge amount of OI with huge short covering seen at 5700 and above strike prices. 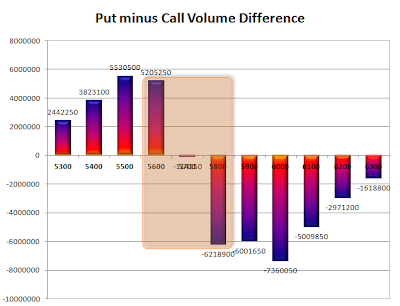 Highest accumulation on Call option 6000 at 99.83 lacs & 5900 at 81.02 lacs whereas Put option 5700 at 85.26 lacs & 5800 at 66.78 lacs. Nifty Open Interest is at 1,60,04,350 up by 7,38,500, with decrease in price, mostly probably huge short build-up. Bank Nifty Open Interest is at 16,11,250, up by 2,05,100, with decrease in price, most probably huge short build-up. FII’s sold 14.01 lacs of Futures, most probably short build-up, as their net OI increased by 13832 contracts and the average price per contract comes to around 5757. FII’s future open contract as on date is 376320. PCR Open Interest (Volume) dropped below 1 for the first time in the series on the back of huge liquidation seen at 6000-5500PE levels. Supports are falling like nine pins, with just 5700 looking good, though covered huge 22.8 lacs for the day. Initial resistance right now at 5800CE, with huge addition for the day at 24.6 lacs and above that at 5900 with OI above 81.02 lacs. Range as per Option Table is 5720 - 5821 and as per VIX is 5696 - 5796 with 5780 as the Pivot. Nifty opened negative on the back of weak global cues, stayed in a small range of 36 points and closed around the lows at 5835.25 a loss of 37.35 points. The broader market was also weak, with just 504 advances to 984 declines. The Bears are taking a firm grip of the Option Interest table with each passing day. 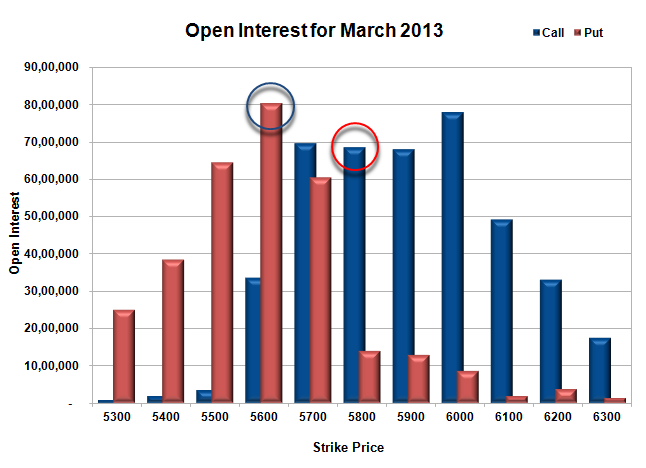 Call option 5800-6000 added 18.72 lacs of OI with profit booking seen at 6100 and above strike prices. Put Option 5800, 5600-5500 added 16.41 lacs huge amount of OI short covering seen at 5900 and above strike prices. Highest accumulation on Call option 6000 at 85.89 lacs & 6100 at 66.18 lacs whereas Put option 5700 at 1.08 crore & 5800 at 88.21 crore. 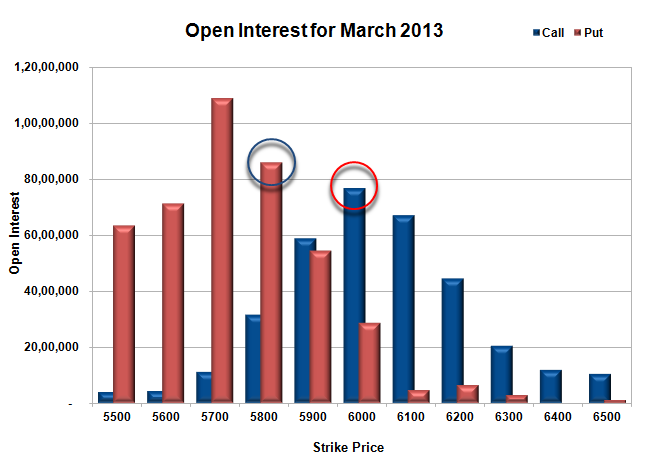 Nifty Open Interest is at 1,52,65,850 up by 2,86,900, with decrease in price, mostly probably short build-up. 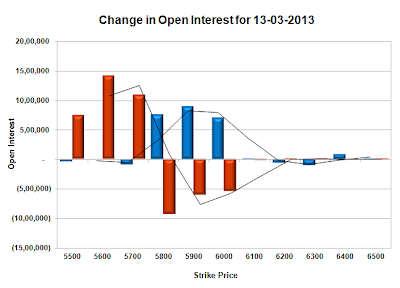 Bank Nifty Open Interest is at 14,06,150, down by 30,650, with decrease in price, most probably long liquidation. FII’s sold 11.95 lacs of Futures, most probably short build-up, as their net OI increased by 16992 contracts and the average price per contract comes to around 5860. FII’s future open contract as on date is 362488. PCR Open Interest (Volume) is again down to 1.340 due to huge liquidation seen at 5900-6000PE levels. 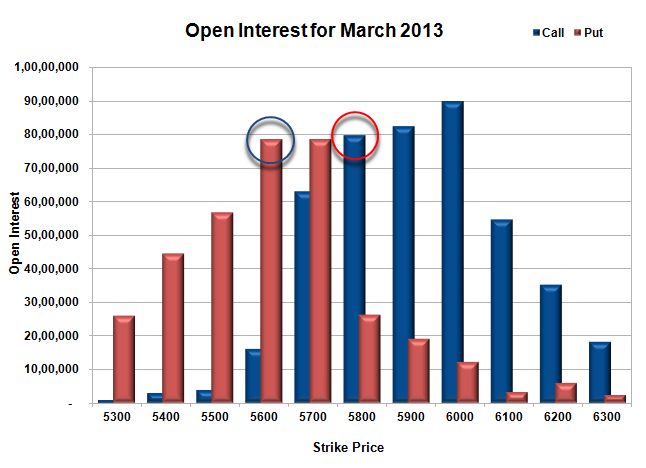 Support is very good at 5800PE, with OI above 88.2 lacs and below that at 5700 with OI in excess of 1.08 crore. 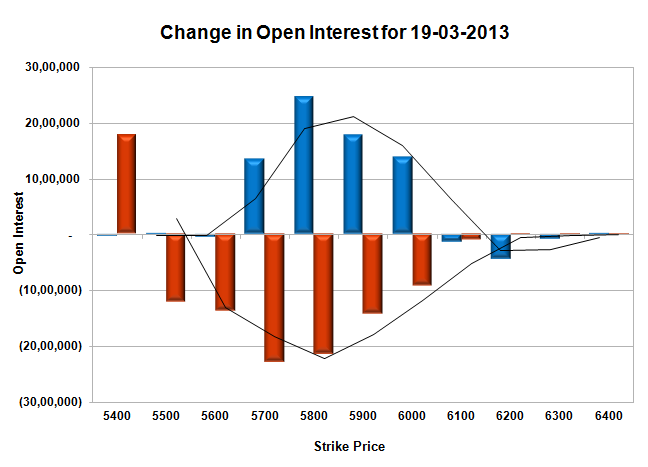 Initial resistance right now at 5900CE, with OI now crossing 63.1 lacs, and above that at 6000 with OI of 85.89 lacs. 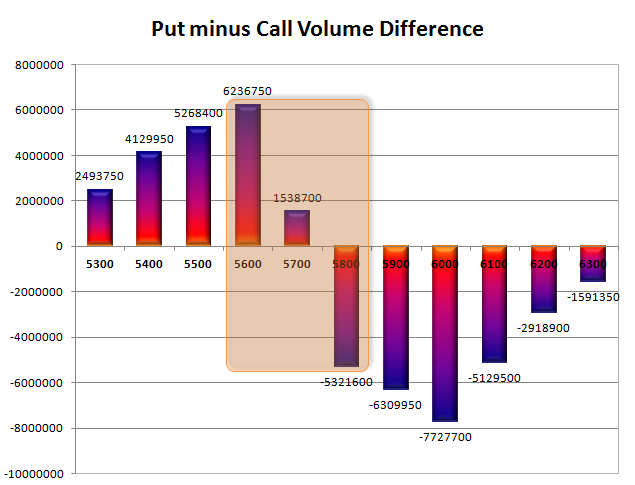 Range as per Option Table is 5785 - 5883 and as per VIX is 5787 - 5884 with 5850 as the Pivot. Nifty opened strong and touched 5940 level, but was sold-off promptly to the lows of the day at 5865, with not much of a recovery seen in-between. The index closed weak below the psychological level of 5900 at 5872.60 a loss of 36.35 points. On a week-on-week basis the index lost 1.2%. The broader market was also weak, with 506 advances to 1003 declines. The index table is balanced around 5800-6000 level right now. Call option 5900-6200 added 8.18 lacs of OI with huge short covering seen at 5800 and below strike prices. Put Option 6000-5800 covered 17.82 lacs huge amount of OI with small profit booking seen at 5600 and below strike prices. Highest accumulation on Call option 6000 at 76.88 lacs & 6100 at 67.15 lacs whereas Put option 5700 at 1.09 crore & 5800 at 85.90 crore. Nifty Open Interest is at 1,49,78,950 down by 69,250, with decrease in price, mostly probably long liquidation. Bank Nifty Open Interest is at 14,36,800, down by huge 1,63,200, with decrease in price, most probably huge long liquidation. FII’s bought 5.03 lacs of Futures, most probably long build-up, as their net OI increased by 10022 contracts and the average price per contract comes to around 5906. FII’s future open contract as on date is 345496. PCR Open Interest (Volume) is down again to 1.391 due to huge liquidation seen at 6000-5800PE levels. Support still placed at 5800PE, though liquidation was seen, still OI is above 85.90 lacs and below that at 5700 with OI in excess of 1.08 crore. 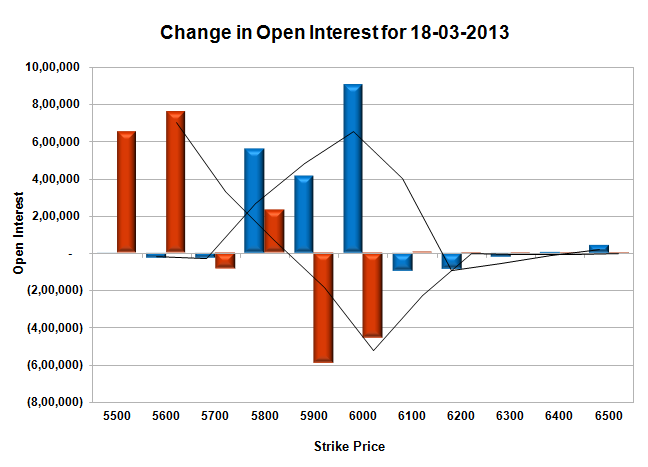 Resistance at 6000CE, with OI now above 76.88 lacs, and above that at 6100 with OI of 67.15 lacs. 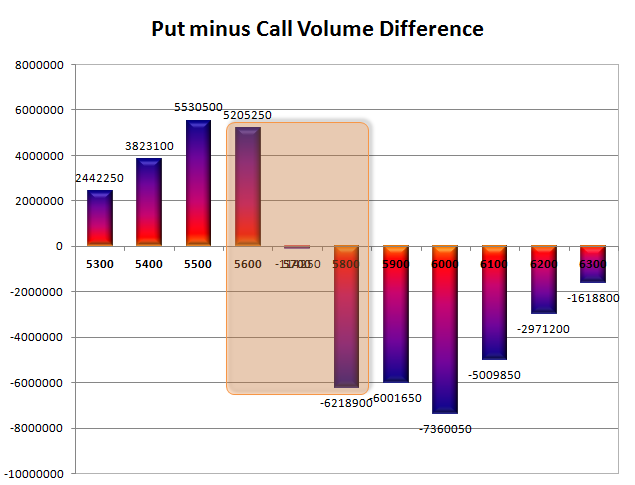 Range as per Option Table is 5839 - 5937 and as per VIX is 5826 - 5919 with 5880 as the Pivot. Nifty opened flat, but was sold-off promptly to the lows of the day at 5790, but the responsive buyer from thereon took control of the situation to move the index above the previous day’s close and above the psychological level of 5900. The index ultimately closed shop at 5908.95, a pullback of more than 120 points from the lows and a gain of 57.75 points. The broader market though was weak, with 725 advances to 747 declines. Today the FII covered most of the index options bought in the last few days and now the range as per OI table is 5800-6000 for the time being. Call option 6100-6200 added 7.54 lacs of OI with huge short covering seen at 5900 and below strike prices. Put Option 6000 added 5.60 lacs huge amount of OI with huge profit booking seen at 5900 and below strike prices. Highest accumulation on Call option 6000 at 72.65 lacs & 6100 at 66.45 lacs whereas Put option 5700 at 1.09 crore & 5800 at 93.66 crore. 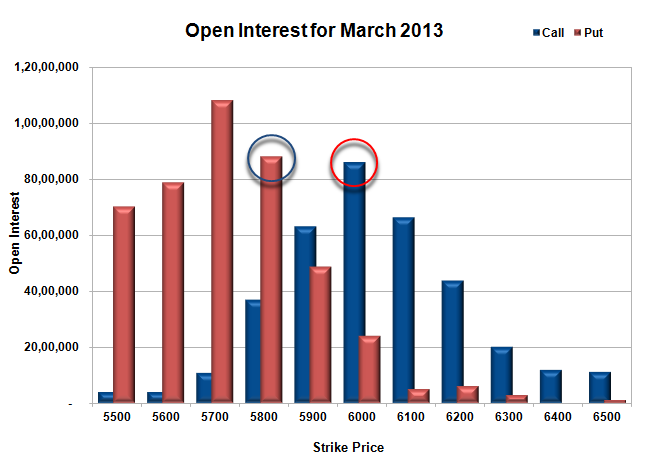 Nifty Open Interest is at 1,50,48,200 down by 4,11,900, with increase in price, mostly probably short covering. Bank Nifty Open Interest is at 16,00,000, down by 1,09,150, with huge increase in price, most probably huge short covering. FII’s bought 0.72 lacs of Futures, most probably short covering, as their net OI decreased by 3895 contracts and the average price per contract comes to around 5958. FII’s future open contract as on date is 335474. 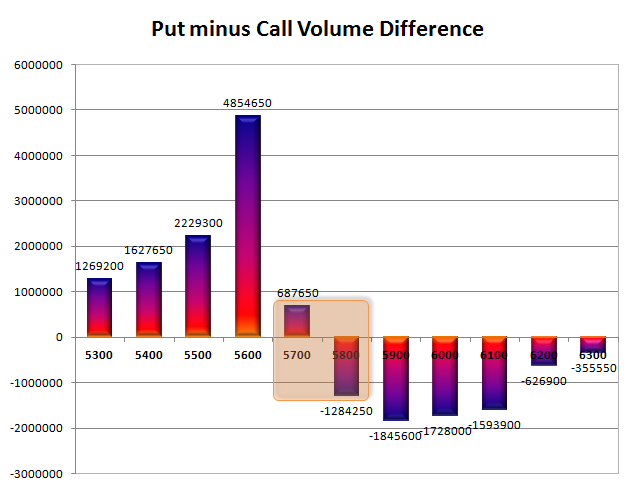 PCR Open Interest (Volume) moved down to 1.456 due to huge liquidation seen at 5700-5600PE levels. Support right now at 5800PE, with OI of above 93.66 lacs and below that at 5700 with OI in excess of 1.08 crore. 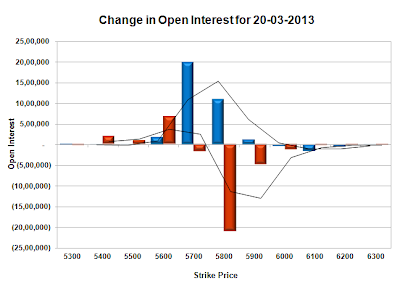 Resistance at 6000CE, with OI above 72.65 lacs, and above that at 6100 with OI of 66.45 lacs. 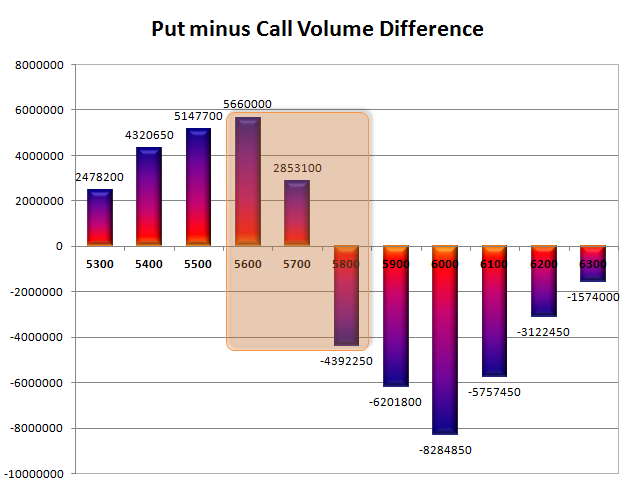 Range as per Option Table is 5835 - 5933 and as per VIX is 5864 - 5954 with 5900 as the Pivot. Nifty opened weak, but though it tried to move up but was sold-off to close at the lows of the day at 5851.20, a huge loss of 62.90 points. The broader market was also very weak, with just 395 advances to 1108 declines. Today’s down move was mostly due to long liquidation and the OI Table saw 6000 established as huge resistance for the series. Call option 5800-6000 added 23.54 lacs of OI with small profit booking seen at 6200 and above strike prices. Put Option 5700-5500 added 32.56 lacs huge amount of OI with huge liquidation seen at 5800 and above strike prices. Highest accumulation on Call option 6000 at 74.28 lacs & 5900 at 63.90 lacs whereas Put option 5700 at 1.31 crore & 5600 at 1.06 crore. 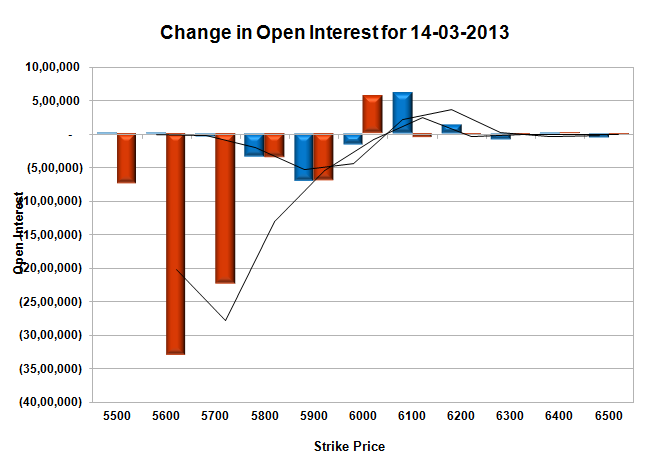 Nifty Open Interest is at 1,54,60,100 down by 6,14,900, with decrease in price, mostly probably long liquidation. Bank Nifty Open Interest is at 17,09,150, up by 39,775, with decrease in price, most probably huge short build-up. FII’s sold huge 3.79 lacs of Futures, most probably long liquidation, as their net OI decreased by 13351 contracts and the average price per contract comes to around 5877. FII’s future open contract as on date is 339369. PCR Open Interest (Volume) has moved down a bit to 1.620 due to huge addition at 5800-6000CE levels. Support right now at 5800PE, with OI of above 97.26 lacs and below that at 5700 with OI in excess of 1.3 crore. 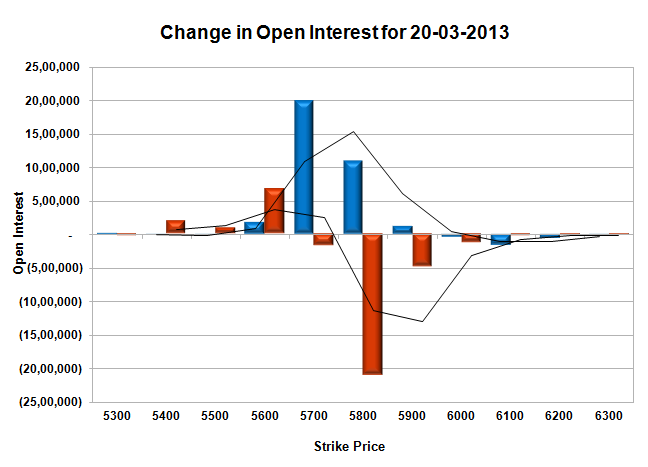 Resistance at 5900CE, with huge addition for the day at 8.94 lacs, and above that at 6000 with OI of 74.3 lacs. Range as per Option Table is 5814 - 5908 and as per VIX is 5802 - 5901 with 5880 as the Pivot. A huge volatile day in Nifty, with the index after a sedate start moved down, though we have better than expected GDP data at 2.4%. The responsive buyer took control from thereon to move the index back around the dotted line, but a late sell-off saw it closing at 5914.10 a loss of 28.25 points. The broader market was also negative, with just 553 advances to 945 declines. 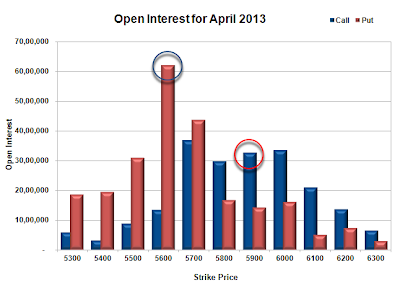 The OI table saw huge addition at 5700-5500PE levels, which looks more like buying. Call option 5900-6000, 6200 added 15.81 lacs of OI with liquidation seen at 5800 and below strike prices. Put Option 6000, 5800-5500 added 61.07 lacs huge amount of OI with liquidation seen at 5900 strike price. Highest accumulation on Call option 6000 at 67.22 lacs & 6100 at 60.17 lacs whereas Put option 5700 at 1.2 crore & 5800 at 1.06 crore. 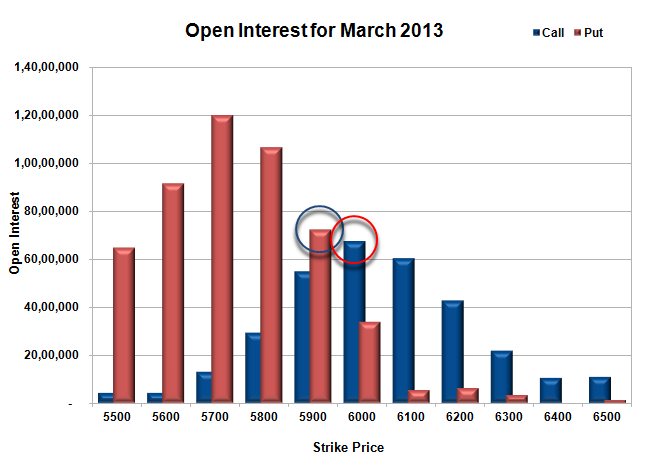 Nifty Open Interest is at 1,60,75,000 down by 5,74,850, with decrease in price, mostly probably long liquidation. Bank Nifty Open Interest is at 16,69,375, down by 1,175, with decrease in price, most probably small long liquidation. FII’s sold huge 8.69 lacs of Futures, most probably short build-up, as their net OI increased by 11650 contracts and the average price per contract comes to around 5954. FII’s future open contract as on date is 352720. 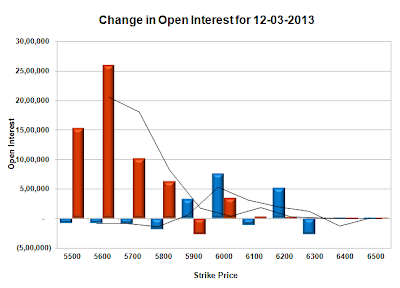 PCR Open Interest (Volume) has jumped to 1.673 due to huge addition at 5700-5900PE level. Support still very much at 5900PE, though covered some OI and below that at 5800 with OI in excess of 1.06 crore. 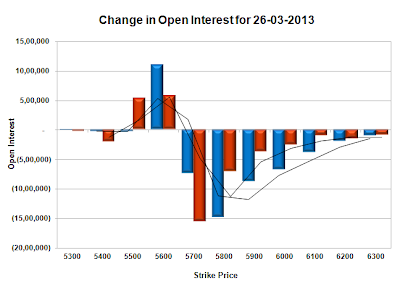 Resistance got stronger at 6000CE, with OI now above 67.2 lacs, and above that at 6100 with OI of 60.2 lacs. 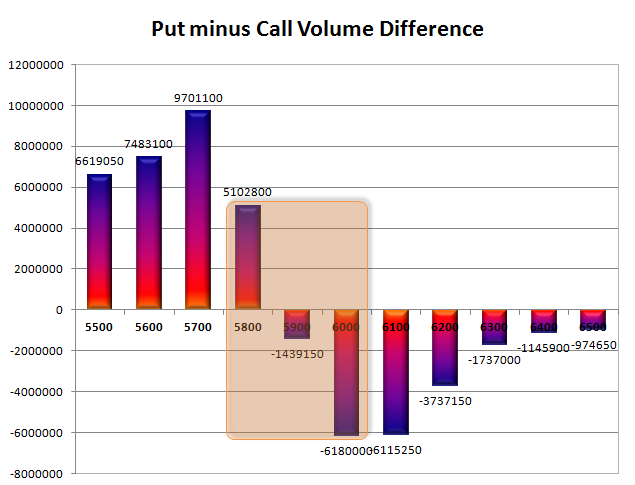 Range as per Option Table is 5872 - 5964 and as per VIX is 5867 - 5961 with 5920 as the Pivot.